This tongue-in-cheek primer on how to be a good farm dog—and how ignoring the rules may result in a biscuit—is a guaranteed treat. 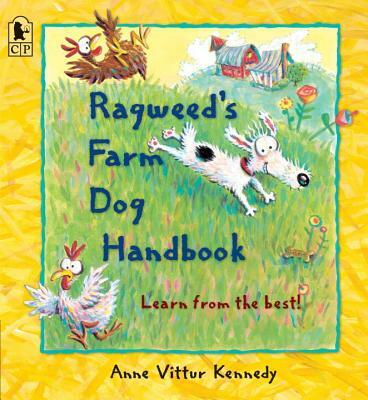 Being a farm dog is a tough job, but luckily, Ragweed’s handbook will tell you everything you need to know. Step one: don’t wake the farmer! You may really, really want to, but that’s the rooster’s job. Of course, if you do wake the farmer, you might just get a biscuit. . . . Full of hilarious dog logic, Ragweed’s Farm Dog Handbook explores the pitfalls—and opportunities!—of a dog’s life on the farm. Readers will love being in on the joke as Ragweed breaks all his own rules, collecting biscuits as he goes. Anne Vittur Kennedy is the author-illustrator of The Farmer’s Away! Baa! Neigh! She lives near Columbus, Ohio. The structure, repeated throughout with clever variations (eating grass like a cow means throwing up a biscuit, “and you can eat that one again”), makes Kennedy’s hero more endearing with every page turn. Buoyant, fresh illustrations in acrylic paints are filled with bright green grass, flowers, fields, and farm animals in motion. But it's Ragweed who is the heart of this delightful story, with his long snout and expressive, bulging eyes...Give that Ragweed an extra biscuit, or just hand over the whole box. A star deserves his just rewards. The repetition, the page turn, the dive into the forbidden will all be a treat for young audiences, and there’s a plunge into mirthful grossness that will detonate amid a group of kids like a hilarity bomb...Kids won’t be able to get enough of this goofy dog who’s smart enough to know on which side his biscuit is buttered. This delightfully subversive guide to being a farm dog will have readers cheering for its scrappy hero, Ragweed, who lives to extract dog biscuits from the farmer...The acrylic paints have a vibrancy and lopsided jolliness that perfectly fit this zany tale, which also gives readers a clear overview of farm animals. Ragweed’s tips and antics are a treat. This book is very funny, with lots of energy and silliness...This pup’s irrepressible energy will win over plenty of readers and give them a fun look at life on a farm. This delightful farm dog charms readers; Ragweed himself is endearing as a scruffy b&w dog with saucer eyes, a long snout, and two front teeth. The bright colors, large brushstrokes, and wary animals in the author’s illustrations complement Ragweed’s happy-go-lucky daily schedule. Readers will chuckle their way through these farm dog rules.